AAVSO Alert Notice 610 announces an observing campaign on the bright (V~4.57) triple star b Per to cover the interval before, during, and after an eclipse predicted for mid-February 2018. Please see the notice for details and observing instructions. For this campaign, spectroscopy is covered in this forum thread, and general discussion and recommendations and photometry are covered in the Campaigns and Observation Reports forum thread "February 2018 b Per observing campaign". Thank you very much for the observational alert. I participated in the last three photometric campaigns and I will enrol again into the incoming one. We will stay in touch! Just only a request about spectroscopy. I could take spectra with a Baader slit spectrograph, able to give resolutions of 800 (covering almost all visible spectrum) and 5000 (covering a window of 700 A wide), but the friends of Aras Spectroscopy could take spectra with échelle-spectrographs and resolutions of 10.000 or more. More details about the requirements of resolution, window coverage or most important bands, etc... would be apreciated. 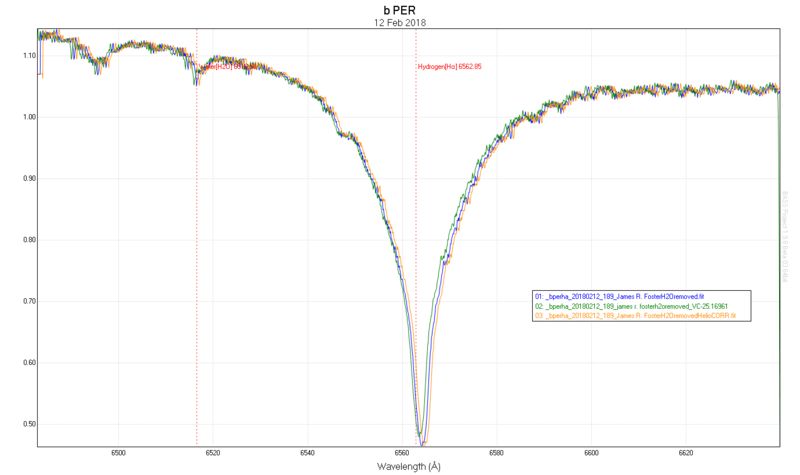 here is a first spectroscopy approach to b Per. The resolution is not very good (I have to focus better) but I hope it will be of some interest. I choosed a window where Ca II bands could be visible. 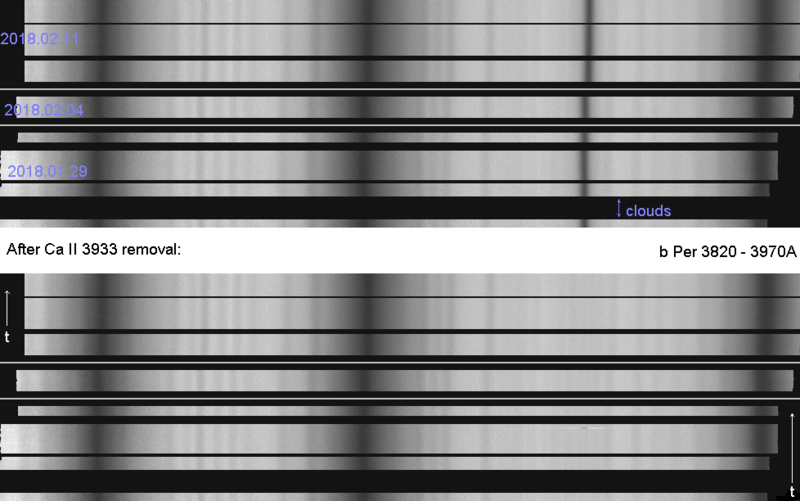 Taken with a RC 14" and a Baader DADOS slit spectrograph (1200 l/mm, slit 25 um, R=4194, 0.1228 A/px). 7x200" integration. Our team of two professional and one amateur astronomers has been observing b Per at two locations in North Carolina since October 2016. We use a 81-cm and a 60-cm telescope equipped with Sheyak's Eshel spectrographs and cover a spectral region from ~4100 to 7900 A with a resolving power of ~12,000. Over 100 spectra were taken in the 2016/2017 observing season and nearly 40 since September 2017. In order to reach the goal of constraining the spectroscopic orbit of the internal binary in this triple system, a spectral resolving power of at least 10,000 to precisely measure the radial velocity is needed. At the same time, lower resolution spectra, especially beyond the above mentioned range, would be very helpful for searching for signs of the third component. The most important period for the spectroscopic observations is the time around the expected eclipse. However, observations before and after the eclipse are also important to provide comparison with the data taken during the eclipse. The signal-to-noise ratio in the continuum has to be high (at least 100), as the third companion is supposed to be much fainter than the stars of the internal binary. We are planning to keep observing the system every clear night until the end of the season in April/May 2018. I've just finished with a spectrum serie (till cloud), by features (Si II, H8, Ti II 3913, CaII 3933, nothing new) there is no change to my previous weeks (see: http://www.spectro-aras.com/forum/viewtopic.php?f=5&t=1952). Evaluating velocities later. Hope somebody continues, forecast got bad here for the next few days. I've taken Ha, Hb, & CaK spectra (LhiresIII with a 2400 l/mm grating) of this star on 4,7,8,9,10, & 12Feb18 while taking simultaneous RVB photometry with an ST-8xe and 400mm mirror lens system ontop of my spectra taking telescope. I still need to upload some M67 data to derrive my transform coefficients with this system. Should have some results by tomorrow....hope it clears for one more run at b Per! p.s. Got another CaK and photometry run yesterday (13Feb18) just before clouls closed up.....thats probably it until Thurs nite (16Feb18UT). The difference between them in 1.8A. I have Hb and CaK for these and other dates I'm about to analyze as well. However, such a curve seems to be known (see SB9 database), though I'm rather curious why mine is not perfectly sinusoidal. It would be nice to see professional evaluations gathered so far, to put our results in context. 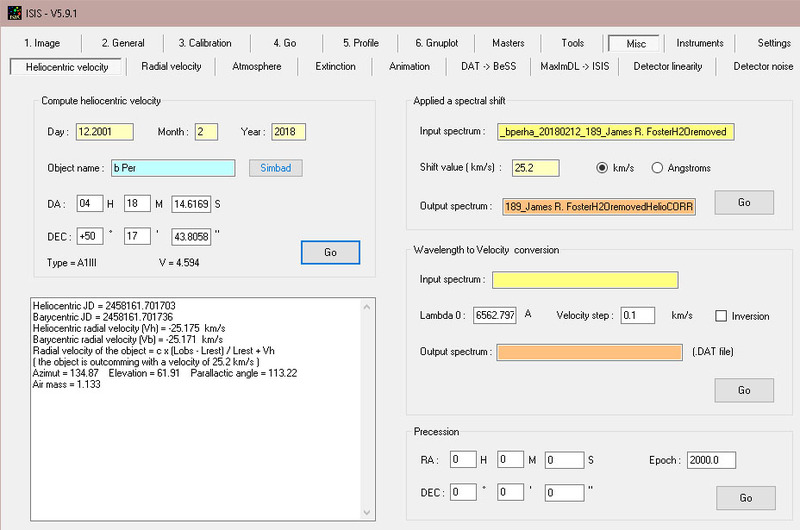 I used Bass V1.98 under the Tools, Calculate Velocity correction. The results box that comes up after I input my Lat/Long/Elev and b PER's decimal RA & Dec says "Barycetric Correction (km/sec)." I'm going to have to take some time to learn how to do the Heliocentric correction in Isis. ISIS knows your location from the setup. The date of observation and name of the target come from the fits header and the target coordinates are brought from SIMBAD automatically provided you are connected to the internet. Thanks for the feedback. I usual stick very clear of any IS function besides (MaximDL) renaming, flats, and image calibration; spent literally 100 hrs on study of IS to get used to spectral functions and ignore all the French still showing in the menu; purely monolingual without google translate! I'm going to my high altitude dark sky site to shoot LhiresIII and LISA spectrum at a dark sky site. Will work on Heliocentric correction in IS when I get back....maybe can figure it out by March hopefully! I think you have got a sign wrong when you made either the Heliocentric or Barycentric correction. The corrections are essentially the same at this resolution (-25.175 and -25.171km/s) so the two spectra should lie directly on top of each other. 3rd component: not an F type? James, when I mess up with the sign (so I did a year ago), you can do a test processing checking heliocentric flag in ISIS project page and see what happens (= yet another method). Note that when sending spectra to database, requirement whether to do heliocentric or not - varies per database and target! I've found the 3rd component doesn't show any relevant CaII 3933 feature, hence either not an F type (contrary to Alert Notice 610), or must be weaker than 1% of the continuum in the blue end. Explanation: I am perfectly able to subtract a properly fitted, per-expsure-shifted single Voigt profile, fitting via IRAF:splot/d/v type, reconstrucing via IRAF: artdata/mk1dspec based on the splot input (velocities already presented in my prev. comment). As you see, the removal is so successful (except 1-2 frames) that other weak shifted features clearly appear, and no other relevant CaII 3933 contamination. Let me know in case this analysis (all my data out of eclipse) was relevant for you. Thanks for confirming my Isis screen was correct. The Barycentric curve shown here was calculated in Bass V1.98, so I assume that is what is wrong. Heliocentric spectra correction was computed in IS with the value of -25.175 km/sec. I will now work on the 9 dates I have spectra on for b PER and find the "true" heliocentric. Thanks for the input! No the barcycentric plot is correct. If you look at your ISIS screen shot you will see that you have entered +25.2 km/s in the shift value (km/s) instead of -25.2km/s. If you enter -25.2km/s the BASS and ISIS results should agree. RE:" No the barcycentric plot is correct. If you look at your ISIS screen shot you will see that you have entered +25.2 km/s in the shift value (km/s) instead of -25.2km/s. If you enter -25.2km/s the BASS and ISIS results should agree." 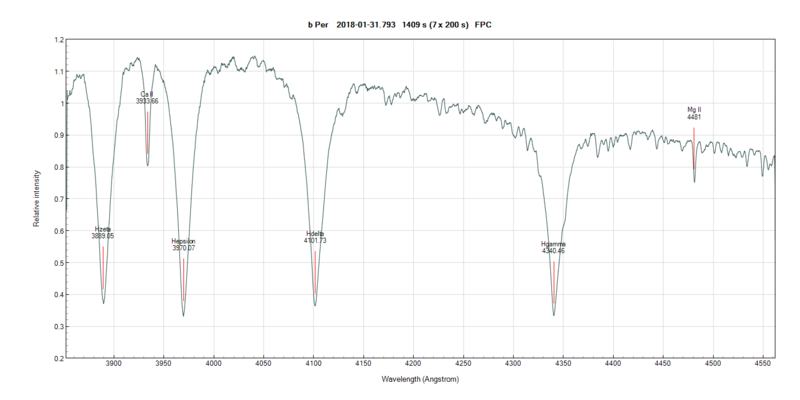 What is very strange, is that the "doppler shift of target" in Bass is positive after loading a IS processed, heliocentric corrected spectra of b PER that IS computed as negative! I'm only using Bass for processeing charts and not for heliocentric correction calculations. For instance, the CaK spectrum .fit header for 12Feb18 shows as follows: BSS_VHEL= -25.043 / [km/s] Heliocentric speed; processed in IS. But in the Bass velocity procssing box for "doppler shift of target" it gives this value as 25.043. BSS_VHEL is defined as the "correction applied"
which is -25 km/s. I am not familar with BASS but perhaps the number calculated is defined as the shift due the motion of the earth, ie the correction to be made would have the opposite sign.